In this corner of my blog, you will see highlighted all the reasons that I believe will be important to you when deciding on Your ODTUG Board Members for this year. I would like to walk you through my campaign statement in more detail while showing you examples of the work that has already been completed in order to kick start most of the initiatives I aim to focus on. By choosing me as Your ODTUG Board Member, you will be giving the ODTUG community a strong chance towards creating long lasting frameworks around all these initiatives that will bring positive growth to our organization. Even though It feels like I’ve been part of this organization for a long time, I have embraced its community, its knowledge, its philanthropy, and its fun. The ODTUGers that know me have felt the drive, passion, energy, and love that I give to our organization. After volunteering in the EPM community, participating in the Leadership Program and presenting at the conference, I was also humbled to receive the prestigious ODTUG Volunteer Award at Kscope18. I am now asking for your support to spread the same spark and passion across all ODTUG communities! Thank you to everyone who has believed in me and everyone who has encouraged me to take a leap of faith and move forward with this important step! Very proud to support @NevianaZhgaba in running for the @ODTUG Board. This is a real opportunity to add a great community member, dedicated professional and @odtug fanatic to the board. You can read about @NevianaZhgaba and her ideas here https://t.co/s43lLrTQit #orclepm #orclapex #orcldb #orclbi Truely amazing candidate. For a fair and open view towards the future I support @NevianaZhgaba as @odtug board member. She has my vote and deserves yours. I believe I can give back even more to our communities by joining a team of smart people that are just as passionate about ODTUG as I am. I believe that I have the vision to drive key important strategic initiatives to add value and benefit the future of the organization. ODTUGers, you can count on me! ODTUG is a non-profit organization run mostly by the volunteers of the four technical communities. Giving back is in our DNA as you’ll see from the most recent Kscope18 Community Service Day. We love sharing our knowledge and helping out! What is #TechGivesBack? It is an initiative that ODTUG volunteers got involved with right after Hurricane Florence impacted the ODTUG headquarters in Wilmington, NC. Within the short period of 1 week, several Oracle tech experts across all communities volunteered their technical skills to meet real-time needs and deliver an app that could be used in other cases of natural disasters across the US and the world. What you’ll see in the following tweets is only the first step towards #TechGivesBack! As Your ODTUG Board Member, I will dedicate my time and energy to create a more organized framework so that more ODTUG members can find ways to participate with whatever availability & technical skills they have in the ODTUG #TechGivesBack initiative! Wouldn’t it be a good idea to use the time volunteered towards these initiatives to also fulfill an Oracle ACE program criteria? I bet even more Oracle experts will be willing to volunteer their tech skills if that was the case. As Your ODTUG Board Member I would take the steps needed to have this framework recognized and supported by Oracle as well. As you can see below some of us have started acting on next steps. I'm very excited to start this project with @sfonplsql about a topic that is very dear to me. We will build a public APEX app connecting millions of people, joining our effort to live more responsibly. I believe that highlighting and constantly recognizing the work that volunteers do across all ODTUG communities will drive member appreciation and also up the number of volunteers that would like to be involved in our current and future initiatives. Wouldn’t it be great if we spend 30 min to 1 hour during the first day at Kscope to publicly recognize not just 1, but so many of the ODTUG members who help with content selection, quarterly newsletters, webinars, meetups, leadership program coordination etc etc.? As Your ODTUG Board Member along with the support of the Board Members aligned to each of the four communities, I aim to enhance the framework of how often we publicly thank and highlight our volunteers. This may sound like a simple act, but it will do wonders when it comes to increasing levels of engagement across all communities! Speaking of all ODTUG communities, being a part of the EPM space, I’ve always been curious to understand what the Database, APEX & BI geeks were up to and what other platforms we could create to share and facilitate knowledge sharing among them. That is why at Kscope18 I decided to interview three well known experts from the other three ODTUG communities. These are the kind of Oracle experts that can make the cross community knowledge sharing sessions valuable because they bring a multi range of perspectives to the table. If you ‘d like to see the interview videos, check out the below tweet. As you can see below, ODTUG members from different communities would like to see more cross community technical knowledge sharing sessions focused on content that offers a familiar medium like Excel, Database Principles or Data Visualization. Familiarity is important to make sure that community knowledge is not siloed, but instead open to be understood by all. Great idea. Opportunity to talk about where each solution applies but also where they can work together. Not many problems a strong EPM and APEX team couldn't solve. But what if I can't wait that long?!?! Where's @GADASHEK with a #Kscope19 countdown?? We did a few cross over sessions a few years back. It would be nice to some some more of this since companies are increasingly using more hybrid type solutions and technologies. Why not have a dedicated #NetWorkIt Kscope early morning speed networking session inclusive of members of all communities? It’s a more structured fun and engaging way to get to know people from all communities. Why not raise ODTUG’s Team Spirit to a new level by organizing a Kscope #LipSyncBattle or some other type of fun activity, centered around a few teams from each community? Who wouldn’t love to attend an event where they get to support and cheer for their own community? We all know that the happier and the more value members get out of the conference, the more successful ODTUG will be. Apart from offering the best Oracle technical content, one of the main reasons that almost everyone attends Kscope is to network, meet old friends and make new ones! We are an amazing community, and we have room to become even more amazing! I am an Idea Activator, a Cross-functional Communicator, a People Developer, a Community Connector with some bonus sparks of Positive Energy! I’ve been told that those are the strongest attributes others draw the most value out of by working alongside me. Raising engagement levels across communities; driving forward new initiatives; Making new members feel welcome; Staying open and curious about technical trends that add value to existing members: That is what I hope to bring to the table! Be it in my Kscope presentations, or all the NY, NJ, CT ODTUG EPM Meetups, or the GE Mini Kscope Back to School events that I have created and coordinated, my ultimate goal has been to add real value to the audience by providing new as well as relevant content from some of the best speakers in the industry. I will go above and beyond to give them the most value back! ODTUG will be successful as an organization if it continues to primarily focus on adding value to current members. There’s a fine balance nowadays that has to be nurtured with care: Structuring content to give insights into cloud and emerging technologies is very important, as long as ODTUG members get the most up to date training on how to add value to their customers by using their existing solutions for which they are invested on. As Your ODTUG Board Member, I aim to solicit frequent input and feedback on how the content offered should evolve to match the needs of our members. One key aspect of soliciting input would be to reach out to conference participants that have chosen not to attend the most recent conferences and understand those reasons. Analyzing these types of insights in a more frequent basis will highlight areas where ODTUG can get better at. And lastly, apart from raising engagement levels across communities; driving forward new initiatives; staying open and curious about technical trends that add value to existing members, with your constant support I aim to initiate and evolve through the years the ODTUG University Outreach program. As Your ODTUG Board Member I would be honored to be given the opportunity to evolve one of the Leadership Program initiatives that I was most invested in: Embarking the ODTUG Emerging Generation of Oracle Technical Experts! The framework has already been created, it only needs to be executed. As a Woman in Technology myself, I have invested a good amount of time in inspiring the next generation of young girls in pursuing STEM careers. I aim to leverage that experience to kick start the ODTUG University Outreach program! •Celebrating 6 years of a movement committed to building the Tech pipeline of tomorrow •Together we can close the gender gap in Tech by inspiring girls and women to code! I am a Woman in Technology, a @DataRestless Millennial, and a Dedicated ODTUG Member! I am no Einstein, but one of his quotes summarizes all that preceded: “I have no special talent, I am just passionately curious!“. I believe curiosity is one of the key traits that will engage our global community to evolve and thrive, all for and because of people like you who care enough to invest in our organization’s future! That and More is ODTUG to Me! 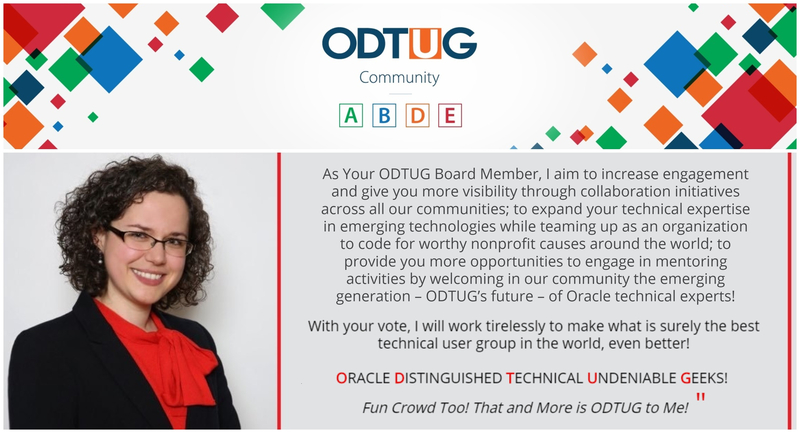 I hope to see you at Kscope19 as a member of Your 2019 ODTUG Board of Directors! Recapping #Kscope18 Blog Post 1/2! Would you really want to miss your opportunity to select Your 2018 ODTUG Board of Directors? Neviana is a Finance Sr. Technical Product Manager in the shared services team that oversees the Oracle EPM suite of applications across all GE businesses. Neviana holds a Bachelor and a Master of Science degree in Software Engineering from Fairfield University. She started her career at General Electric through the GE Digital Technology Leadership Internship Program. Neviana has held various management roles across GE Corporate, GE Capital, GE Treasury and GE Digital, implementing global cross-functional solutions in the financial services space.